There are many types of bees, and each variety requires a unique approach for removal. Honey Bees are beneficial because they pollinate flowering plants, including those used for food. Unfortunately, they are also responsible for a significant number of insect stings. So, control is warranted when nests are located near, or in, your home or business. Honey Bees from European stock attack only when the colony is threatened, making them unlikely to sting when away from the hive. That is, unless they are provoked, like when you step on them. Hives are typically located in places that offer shelter from the weather, such as hollow trees, attics, or hollow walls. Africanized honey bees look just like the domestic variety, and a specialist is needed to tell them apart. 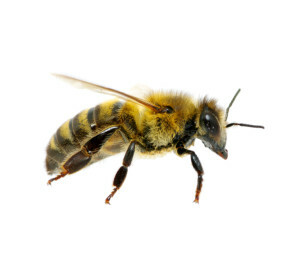 Despite their identical appearance, Africanized bees are extremely aggressive when disturbed. About a dozen species of Bumble Bees are common to Missouri. Although also beneficial to pollination, they are a concern because they have a painful sting, and often make nests underneath landscaping. Unlike Honey Bees and Bumble Bees, Carpenter Bees are not social insects and do not live in nests. Carpenter Bees construct “galleries” for their young by boring into (preferably weathered, unpainted) wood, hence the name. Our Cogent technicians are experienced at determining nesting locations based on bees’ behavioral patterns. And we offer treatments designed to treat nests in many locations, including eaves, walls, trees, even underground. However, sometimes it is much more practical to treat their pathways that they travel through, such as cracks and voids. There are many types of bees, and some require a unique approach for removal. Once identified, our technicians will tailor a solution specifically for your situation. We utilize liquid as well as dust treatments, and many times, nest removal is included in the cost of treatment.